Sixt rent a car offers affordable rates on a large selection vehicles at our Atlanta Buckhead location. We specialize in renting luxury vehicles at economy prices so you can have a first class driving experience. Whether traveling on business, with family or have another purpose in mind for renting a car, our fleet can easily accommodate your plans. Choose what will suit you best and book online or over the phone. You can include our deals on useful add ons and upgrades when you make your car rental reservation. For an easier and more convenient car rental experience, be sure to download the Sixt App, which has been designed to add an extra layer of intuitiveness and customization. Please note we can only guarantee you to receive a vehicle in your chosen car category, not for a specific model. Take GA-400S and take exit 2 to Lenox Rd. No matter your reason for renting a car in Atlanta, with Sixt you will have the means to move around in comfort, style and ease. Available for car rental from our Atlanta Buckhead location is a variety of compact cars, sedans, sports cars, convertibles, and SUVs. We even have a selection of vans and trucks for those who looking to transport cargo or a group. Tailor your reservation to your needs with extras like child seats, GPS, additional driver coverage or protection plans. Customers also have the chance to reserve the rent a car of their choice shortly before pick up with our iPhone app. We look forward to handing you over the keys and getting you on the road from our Atlanta Buckhead branch! Sixt rental cars are now only minutes away from public transport! Exit Marta at the Lenox train station towards Lenox Mall. 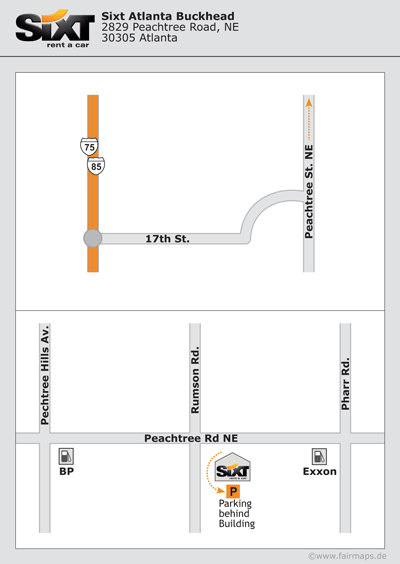 Pass Lenox Mall and continue on Peachtree Street walking South. After you pass the Intercontinental Hotel, Sixt will be on your left, next to the Orvis Outfitter store.